This book is filled cover to cover with beautiful DIY projects that would look great in anyone’s home. If you’re a beginner are crafting, the tutorials in this book aren’t super detailed but I think they are still fairly easy to follow. 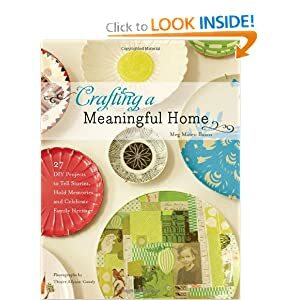 Inside the book you will find 27 different tutorials, showing you how to create projects for your home, there are decorated dishes, vases, etc. I definitely recommend this to anyone who has recently moved into a new home, looking to restyle their home, or anyone just looking for a good read. What good craft books have you read recently? Any that you would recommend? Nice book. I read it before.